Late 1950s, Warsaw, Poland. In the gateway of the house at 8 Marszałkowska Street, photographer Tadeusz Rolke is approached by a man who asks him to see and review his photographs. Rolke is a photojournalist, already highly regarded, working for the Stolica weekly, the editorial offices of which are located in the building. Living upstairs is the man, whose name is Eustachy Kossakowski. His photographs prove intriguing enough for Rolke to secure him a job at Stolica, and the two strike up a friendship that will continue until Kossakowski’s death in 2001. Rolke repeats the recruitment manoeuvre when he moves to the prestigious Polska monthly; the two will work there until 1970. During the same time, through artist Marian Bogusz, Rolke gets to know Edward Krasiński, whom he frequently meets at social occasions. In the subsequent years, Rolke portrays Krasiński at a ball at the National Philharmonic, at a modern art exhibition at the Zachęta Gallery, at an opening of Henryk Stażewski’s exhibition at the Krzywe Koło Gallery, at Kraków’s Krzysztofory Gallery, and in Zalesie, where Krasiński lives with Anka Ptaszkowska. Rolke and Krasiński remain close acquaintances in the art community. In 1970, Tadeusz Rolke moves to West Germany, while Eustachy Kossakowski and Anka Ptaszkowska relocate to Paris. The two photographers’ beginnings in the West are difficult, both having to build everything from scratch. Rolke soon settles in Hamburg, where he starts working for German magazines and institutions, while Kossakowski, following the success of his exhibition 6 mètres avant Paris, gets a job at the Centre Pompidou. Rolke’s first trip out of Hamburg is to Paris to meet his friend, whom he keeps in touch throughout the 1970s. He has no contact with Edward Krasiński during this time. 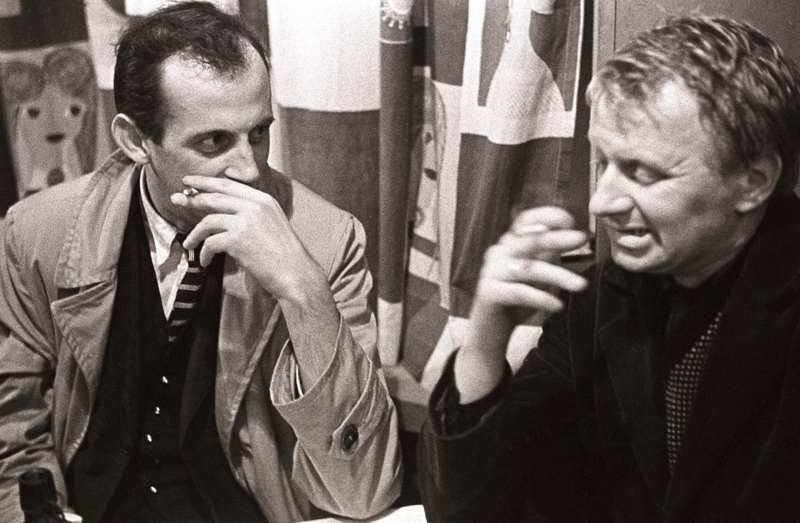 During the brief Solidarity ‘carnival’ of 1980–1981, Rolke frequently visits Poland, where he also meets Kossakowski. Following the introduction of martial law in December 1981, Rolke decides to return to Poland. He works independently, rejecting offers from the regime press, earning his living from commissions for German magazines. In the 1980s, Edward Krasiński needs a photographer. Since Kossakowski lives in Paris, he approaches Rolke. Besides documenting Krasiński’s successive artworks and installations, Rolke photographs fragments of his home/studio at Świerczewskiego Street, which becomes an integral part of Krasiński’s oeuvre. The latter stresses the photographer’s input, but doesn’t go as far as to put his signature on the artworks. There is no financial aspect to their collaboration. Working closely with Krasiński, Rolke sees a man who isn’t happy and who masks his unhappiness with art, through outward naivety and pretending to be someone else. Krasiński, whose daily rhythm is measured by the consumption of alcohol, coining famous bon mots and functioning as a major social attraction, turns out to be someone else in Rolke’s presence — an artist who is the epicentre of his own world. Rolke portrays Krasiński at the Foksal Gallery and in Zalesie, in the 1990s in his hometown of Lutsk, Ukraine, at the Gruba Kaśka diner in Warsaw or at the nearby butcher’s shop, where Krasiński stages his exhibition. He also takes pictures at Krasiński’s famous birthday and name-day parties, as well as creating a dramatic series of the artist’s intimate portraits. In the 1980s and 1990s, Rolke remains in constant touch with Eustachy Kossakowski, whom he photographs in Paris and during the preparations for the exhibition Apostles at Warsaw’s Foksal Gallery (1988). For Rolke, Apostles evidence the photographic perceptiveness and inquisitiveness of Kossakowski, who elevates the backs of Vatican apostle statues or fallen telegraph poles near Brok to the rank of art. It is precisely in Brok in eastern Poland, where Kossakowski buys and renovates a house, that the two photographer friends’ last meetings take place. Eustachy Kossakowski dies in 2001 in Paris; Edward Krasiński departs three years later in Warsaw. E-K is a private tribute paid by Tadeusz Rolke to two people whom he held in very high esteem and whom he had been friends with for five decades.